The three other racing stand-outs that are competing against Clint Boyer are NASCAR driver Kyle Busch who built a “Rowdy Edition Toyota Camry, NHRA Funny Car driver Alexis DeJoria converted a Tundra pickup truck into a beastly desert pre-runner, and NHRA Top Fuel points leader Antron Brown modified a Sequoia for maximum speed. The winner gets bragging rights and a $50,000 check from Toyota that will be given to the driver’s chosen charity. If Bowyer wins the competition, the money will benefit the Emporia Community Foundation, which provides services and support to improve the quality of life in Bowyer’s home town, Emporia, Kan., and its surrounding counties. Under the direction of Boyer, the RKM Performance team gave the Prius some major high-tech modifications including a 17-inch custom touch screen with built-in Windows 7 computer, two ASUS 12-inch tablets, and a side-view camera system that replaces the factory mirrors. 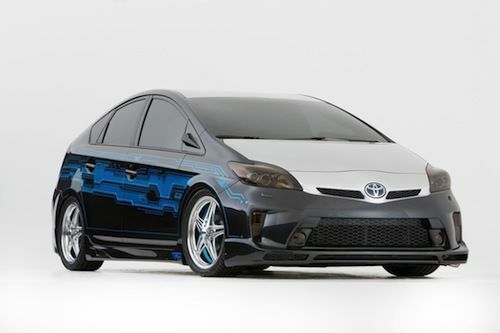 The crew strung 45 feet of fiber optic lighting to give the “Tekked-Out-Prius.” just the right mood inside. The car will also be outfitted with a 16-speaker JBL audio system with two amplifiers and six crossovers for the ultimate sound system. The sinister-looking black-on-black Prius also gets some extra luxury features inside with custom leather and suede upholstery, imported German carpet and electric blue stitching accents to complete the look. And what race car driver wouldn’t want to give his car some attitude. Boyer added a set of Megan Racing springs and shocks that bring the hi-tech hybrid down "lower than a Sprint Cup car," according to Bowyer, while it rolls on a set of custom EVOD wheels that finish the sinister looking exterior look. Fans can vote once a day for their favorite car beginning on Oct. 20 and will continue through Oct. 29. They can vote on the Toyota Racing Facebook page where they can also enter to win prizes, and one fan will win a Toyota Racing “Dream Trip.” Kyle Busch’s "Rowdy Edition" Camry will make its premiere, along with its competitors at Toyota's press conference at the SEMA show in Las Vegas on Oct. 30 at 11 a.m.